As I mentioned before, all of the wiring and most of the components of the amplifier were replaced. These old amps are using carbon-composition resistors. Such resistors change their value from stress and aging. I found that some of the resistors were off by more than 20%. I used precision flame-proof metal-film resistors and ceramic-composite resistors where low inductance is required (grid bias). This picture shows Wafer C of the band-switch along with the Pi and L input networks, the large filament choke, ALC circuit components and the two valve sockets. The two grid bias resistors are of ceramic-composite type. I also installed bigger (both capacity and max voltage) silver-mica caps in the grid grounding circuit. This will lower the impedance to ground on the lower bands and should result in more output. The original caps can't handle a lot of current and often fail. The length of the leads must be kept to the minimum to avoid extra inductance. 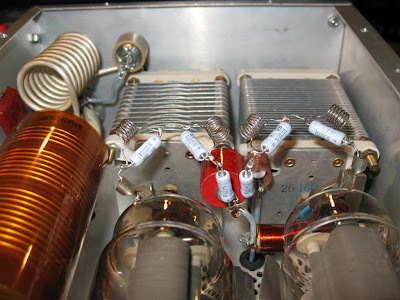 A metal-film low-inductance power resistor between the input circuit's rotary switch and the tube's cathode circuit is installed to limit the possibility for over-driving the amp. Before installing the input circuits, I made sure that all of the ferrite cores in the inductors are moving so I can align them later. Extra caution is needed since these cores sometimes get stuck or are glued inside the coils with wax and it is very easy to break the ferrite core when rotated. 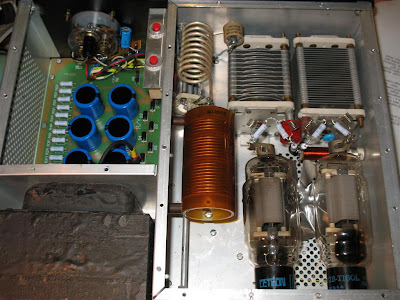 Top view of the amp with the RF deck on the right and the HV power supply and power transformer on the left. 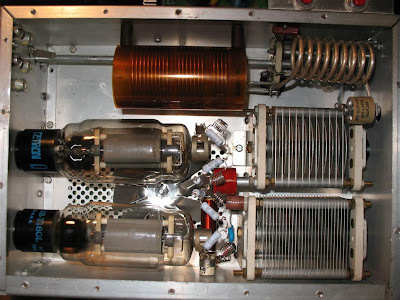 Both variable capacitors were inspected for signs of arcing, cleaned and lubed. Any signs of arcing and sharp points on the blades must be smoothed with very fine sand paper and cleaned well from the dust afterwards. Picture of the RF deck. 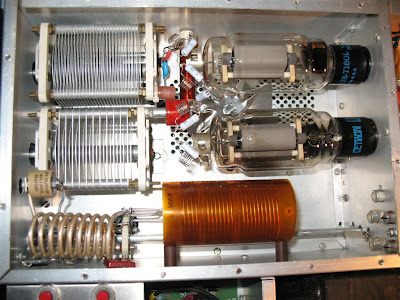 The two original Centron 572B valves seen in the picture were replaced by a matched pair of RF Parts, Inc. 572B Taylor valves. The 10m/15m silver plated tank coil was cleaned with Deoxit D5 solution. Wafers A , B and C of the band-switch were inspected and carefully cleaned with extremely fine (0000 size) steel wool and Deoxit D5 and then treated with Deoxit ProGold. Using steel wool to clean an RF switch requires *very good* washing with alcohol afterwards, as well as using strong magnet and compressed air to get rid of ALL metal particles. The switch should absolutely clean from metal particles and contaminants before installation. After the cleaning, the switch looked almost as new. The output multi-band tank coil was encased in Kapton foil and all leads were inserted in teflon tubing. The new Low-Q parasitic suppressors designed by Rick Measures, AG6K. The new design includes two sets of suppressors in series (per valve) for an improved performance and amp stability. Resistive Nichrom wire is used to make the inductors - the kit includes silver solder and special (very corrosive!!!) flux for soldering Nichrom. Metal-film resistors used in the suppressor can handle power dissipation in the excess of the rated 3W. An extra 1 Ohm resistor in the anode circuit of each valve serves as fuse in case of a catastrophic valve failure. 572B is a relatively unstable tube when it comes to parasitic VHF oscillations so these suppressors should help a lot. Another view of the RF deck. I had to repair the plate choke with a new winding. The old one had badly burned wire enamel. The new choke is covered with kapton/silicone adhesive tape. It is barely visible in the top-center of the image. Right next to it is the new blue high-voltage plate filtering capacitor. The door-knob capacitors in the output circuit were inspected and one of them had to be replaced (it was showing signs of arcing). I used a layer of Kapton tape around this capacitor (the red one in the middle of the two variable capacitors) as extra precaution. Update: I did also some work on correcting the filament voltage. It is posted here. I am installing a kit into an Ameritron AL-811 (not the 811H), with 3 811A tubes, but I can sort out the differences from circuit diagrams and reference to your photos. As an aside, I don't have handy any instructions for tuning up the input pi circuit coil slugs -- should be basically the same between this and the SB-200, judging by what I have seen so far. What procedure have you used? My thought was to use the tune-up procedure for the output tank circuit into a dummy load that Ameritron recommends, then tune for lowest VSWR between exciter and amp at the center of the band, then check the edges of the band and shift the lowest point slightly to get equal VSWR at the ends of the bands. Does that sound reasonable? 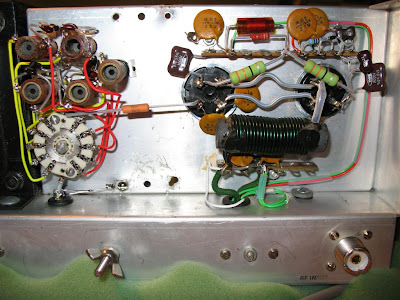 I'm driving the amp with a Ten-Tec Orion, and I am installing the anti-glitch diodes and the negative RF feedback resistors as well. Sounds about right. The input impedance of the tubes changes as the anode tank circuit is tuned. You need first to tune the amplifier properly into a dummy load, then with SWR meter connected between the exciter and the amp input you can tune the input circuit for minimum SWR. Then re-tune the amplifier again - if the input circuit was way off the first time and SWR was initially high your exciter will auto-decrease power. By re-tuning the amplifier, you will get maximum output under the new SWR condition. Then if needed - re-tune again the input circuit. You can do this as many times as needed until you get minimum input SWR and maximum amplifier output. Remember, you can start with low drive power but you should do the final tuning of the amplifier with the maximum allowed drive power (monitor plate and grid current). Your goal is to have the tubes working with full output into a dummy load and adjust the input circuit for minimal SWR under this condition. Many thanks, Andrey. I hadn't even thought about using lower exciter power to get the input pi circuit "in the ballpark" before going to full power, but I was aware that I should always tune the amp at my maximum expected output power, and never tune at a lower power setting and then "turn it up". Always a good reminder, though, since I know substantial non-linearity and "splatter" can result if this is not done. And as with anything tuned, where there is more than one adjustable item, it always pays to go through the tunning procedure, then go through it again, continuing until there is no meaningful difference between the previous setting and the current setting. My last radio was a TS-520S, so I learned a good bit about output tank circuit tuning from running that in a healthy manner, but this is the first time I've used a grounded-grid amp, and with a solid state drive. Your comments are extremely helpful and quite welcome. Hope to work you with the finished Ameritron soon -- I've got the anode suppressors built and ready to solder (thanks to Almost All Digital Electronics for making it a doddle to get the inductors at 120 nh with their L/C Meter IIB! ), the grid fusing installed, and am awaiting word from Mr. Measures on where exactly to wire in the filter cap glitch resistor and glitch protection diodes. :D Tnx es 73 73 73 de AF6ME! Final note: Got everything built and installed, and so far everything is perfect! 700W peak output on 80m, 550W peak on 20m (per my Dishtronix calibrated RF meter), no overdrive with 100W exciter input, and stable as a rock, with top reports from folks with 'scopes on their receivers about lack of spltter and clean signal on the 'scope. Thanks for the help, and I've learned so much about grounded grid and tube amps in general since starting this project. Tnx es 73 and see you on the air!